Definition at line 2397 of file xmlstorage.d. Definition at line 2405 of file xmlstorage.d. Definition at line 2400 of file xmlstorage.d. Definition at line 2403 of file xmlstorage.d. Referenced by xmlstorage::XMLWriter::create(), and xmlstorage::XMLWriter::write_post(). Definition at line 2401 of file xmlstorage.d. Definition at line 2399 of file xmlstorage.d. Referenced by xmlstorage::XMLWriter::create(), xmlstorage::XMLWriter::write_post(), and xmlstorage::XMLWriter::write_pre(). Definition at line 2402 of file xmlstorage.d. 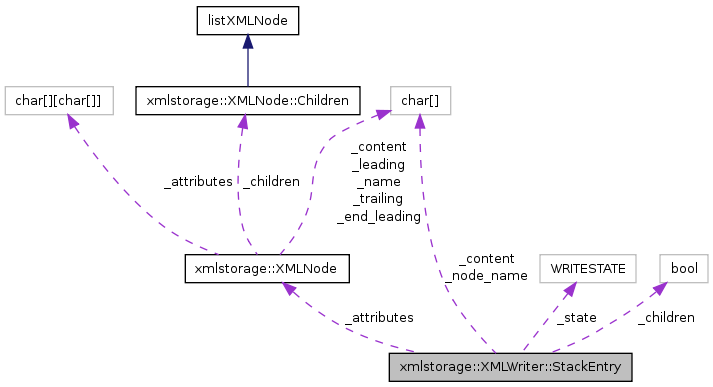 Referenced by xmlstorage::XMLWriter::close_pre(), xmlstorage::XMLWriter::create(), xmlstorage::XMLWriter::write_attributes(), and xmlstorage::XMLWriter::write_post().